The new Honda CBR400R was showcased at the 44th Tokyo Motor Show, in Japan. The motorcycle is based on the same platform as the Honda CBR500R, and a newly designed engine. The 2019 CBR400R is designed on the lines of its elder sibling, the CBR500R which was showcased at the 2018 EICMA. The front end is styled sharper than its predecessor and the bike sports an aggressively designed headlamp setup. The side profile is very similar to that seen on the 2019 CBR500R, however, the CBR400R features its own styling bits. The 2019 CBR400R gets a sharp tail section and a side slung exhaust. Powering the bike is a liquid-cooled, 399cc parallel-twin motor which is derived from the CBR500R's 471cc engine. 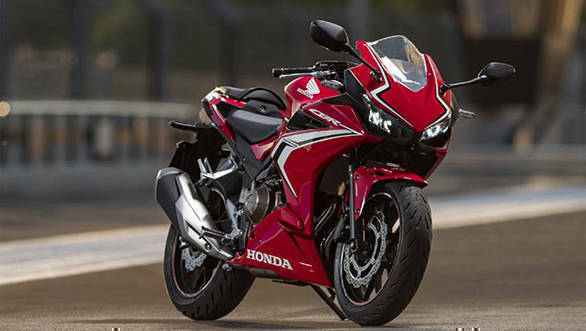 The 2019 CBR400R produces 47PS at 9,000rpm and 38Nm at 7,500 rpm. Power is sent to the rear wheel via a six-speed gearbox. The bike is equipped with conventional telescopic fork setup at the front and mono-suspension at the rear. The brakes are a single disc unit with combined anti-lock braking system (ABS) at both ends. The 2019 CBR400R tips the scale at 192 kilograms and comes with 17-inch alloy wheels with 120mm section tyre in the front and a 160mm section tyre in the rear. The bike also gets a 17-litre fuel tank which offers a range of approximately 650 kilometres. It is unlikely that the bike will be launched in the Indian markets, that said, there is a possibility for Honda to bring a direct rival to the Kawasaki Ninja 400. If launched the 2019 CBR400R will also rival the KTM RC390 and upcoming 2019 Yamaha YZF-R3.